Not long ago I talked about my love for the roasted chicken and its many uses. What I didn’t tell you is that more than anything I love the rotisserie chicken you pick up at the grocery, the one that they have cooked for you. The appeal is obvious-no cooking for me tonight! My work is done. If you are not one to sit at the table and assail the roasted chicken with your bare hands but want a more civilized experience here is an easy way to add a few other things into the mix and have a nice one plate meal. 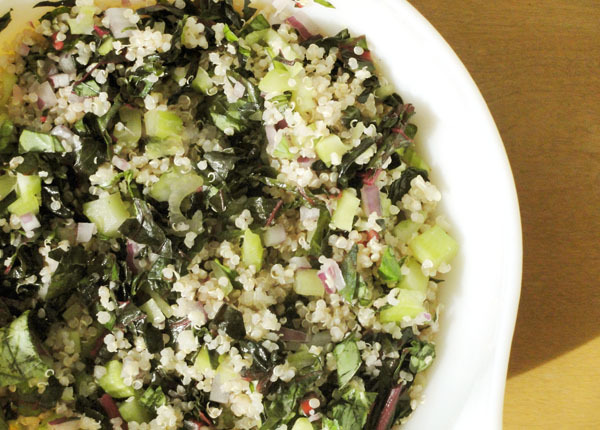 Combine the first 6 ingredients in a large bowl, dress with your favorite sesame-ginger salad dressing to you liking. This entry was posted in Dinner, Lunch and tagged cabbage, chicken, dairy-free, gluten-free, slad on February 24, 2014 by nursingmomscook. I got these beautiful purple potatoes from my winter CSA share and really wanted to share them with someone-why not you? They look so nice next to lentils, which are not known for their good looks. Or taste for that matter. I think of lentils as one of the more blah foods out there even though they’re healthy and full of good stuff for you and all that, I still need to disguise them with other ingredients to reap their benefits. You can buy lentils in a can, which eliminates the overnight soaking or whatever those people who write recipes and don’t have babies will tell you to do (look for them with the Goya canned goods if you have a hard time finding them in your store). This is a fantastic example of a make-in-stages recipe. The dressing can be made hours ahead of time. Potatoes can be boiled and left to cool at any point. After that, it’s just throwing things together in a serving bowl. Keeps for 3 days refrigerated in an air-tight container. Make the dressing: Place the chopped shallot and red wine vinegar in the bottom of a small bowl and let sit for 5 minutes. Whisk in minced garlic, dijon, a pinch of salt, a few grinds of black pepper and olive oil. 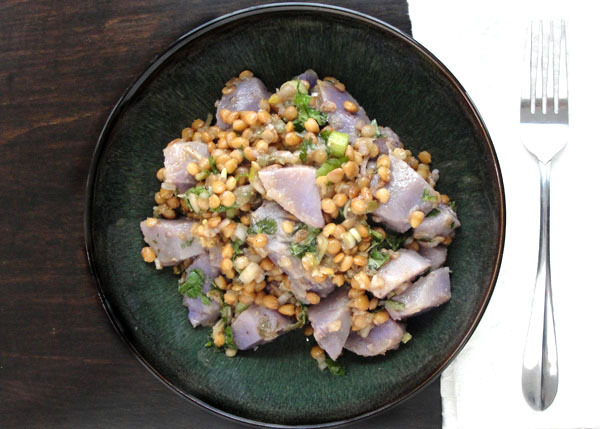 Stir in chopped capers, relish and scallions. In a large pot cover the potatoes with 2 inches of cold water. Bring to a boil, reduce to a simmer and simmer until potatoes a re soft when poked with a sharp knife. Remove and let cool enough to handle. Cut into 1 inch pieces. Assemble salad: Place potatoes in a serving bowl. Add lentils, dressing and all but 1 tablespoon of parsley and combine. Adjust seasoning with additional salt and pepper if needed. Scatter salad with remaining parsley and serve. This entry was posted in Dinner, Lunch, Snacks and tagged capers, garlic, gluten-free, lentils, mustard, potato, salad, shallots, vegan, vegetarian, vinigrette on February 3, 2014 by nursingmomscook. Taco night in my house is one of my go-to meals every week. Its easy and everyone at the table will eat it. No special prep needed. 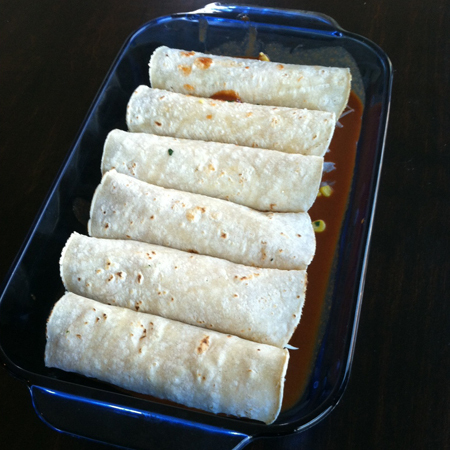 Looking to expand my repetoire of easy meals, I set out to master the enchilada. Its similar to the tacos I make but with enchiladas you put everything in one big dish and bake it. This means it can be put together ahead of time or in phases as you have time in between diaper changes and feedings. If you’re lucky enough to have an extra hand around the house one day, try to put a second enchilada dish together and stick it in the freezer for a future meal. What I like about enchiladas is that you can throw just about anything you have into them. It’s an excellent way to clean out the produce drawer or the cabinet. Leftover chicken can go into the filling but also any combination of the following things work well if you have them in your refrigerator or cabinet: spinach, corn, rice, black beans, tomatoes, green onions, peppers of any color, olives, salsa. I could go on but I think you get the picture. Enchiladas are also a great way to sneak veggies to a picky eater. I suggest shredding carrots or using finely chopped spinach because finely chopping or shredding anything is the best way to sneak foods past the picky one. In the interest of saving time I am going to suggest that you buy enchilada sauce, rather than make your own. Buying pre-grated cheese will save you some work as well. In a small skillet saute the onion and garlic in 1 tbsp of oil until soft, about 5 minutes. Remove from the pan and let cool. Add a little more oil to cover the bottom of the pan and turn the heat to medium. Now add one corn tortilla and fry for about 30 seconds on each side so the tortilla is browned and softened. 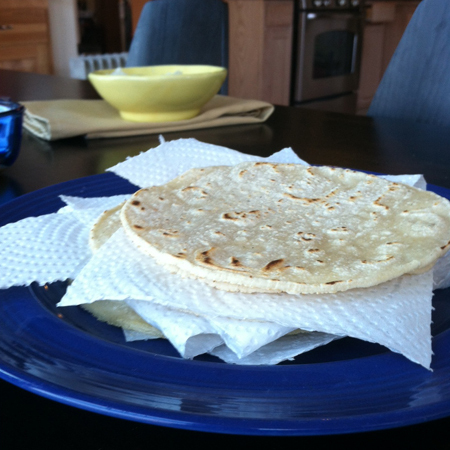 Remove from pan and put the tortilla on a plate with a paper towel. Repeat for the remaining tortillas. Spread ½ cup of enchilada sauce to cover the bottom of a 9×13 pan. Take a prepared tortilla and cover 2/3 of it with shredded cheese. Add a scoop of the onion-garlic mixture. Now add the fillings of your choice and roll up into a tube. Place it seam-side down in the 9×13 pan. When the pan is filled cover with the remaining sauce and top with the remaining cheese. Garnish with chopped green onions or black olives if you’re feeling fancy-pantsy. 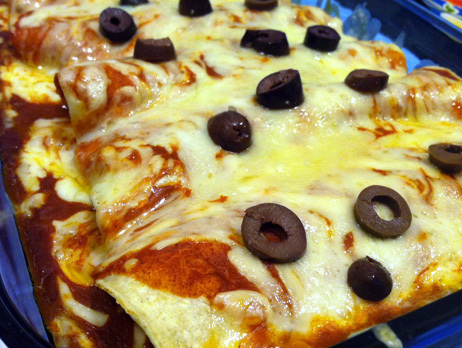 This entry was posted in Dinner and tagged enchilada, gluten-free, glutenfree, make ahead meals, tortillas on January 13, 2014 by nursingmomscook. Sometime last spring I planted a packet of seeds to grow some rainbow carrots. Most of the seeds sprouted, I got them into the ground in my meager little raised bed and then I kind of ignored them for months. Their greens grew bigger and bigger, my husband implored me to harvest them. I told him it could wait until fall. Finally one day I noticed the top of a big purple carrot poking out of the ground. I got my trowel and dug. Wow! Such beautiful colors. So many carrots. So. Many. Carrots. 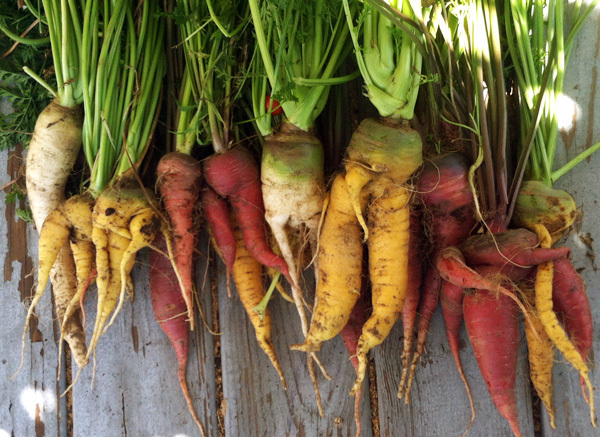 So many freaky, twisted, mutant looking carrots. So hard to peel. It seems only right that they are paired with another freaky, mutant-looking plant called ginger. Before all the carrots went limp sitting in my produce bin, I put together this lovely carrot ginger soup. If you are a soup maker, I highly recommend getting a stick blender if you don’t already have one. Its about a million times easier to puree your soups with one. If you put hot soup in a blender to puree, the heat will create a volcano effect. You’ll open up the blender and your nice batch of pureed soup will explode all over your counters, your ceiling and best of all-on you! Heat 1/2 cup broth to a simmer in a medium saucepan over medium-high heat. Add onion and garlic and cook until tender, about 6 minutes, stirring occasionally. Stir in ginger, carrots, potato and remaining broth and heat to a boil. Reduce to a simmer, cover and cook 25 minutes or until vegetables are tender. If you have a stick blender, use it to puree the soup in the pan. If you don’t have a stick blender, let the mixture cool then, in batches, carefully puree in a blender. Add water or broth if needed to thin to desired consistency. Reheat soup if necessary. Stir in lemon juice. 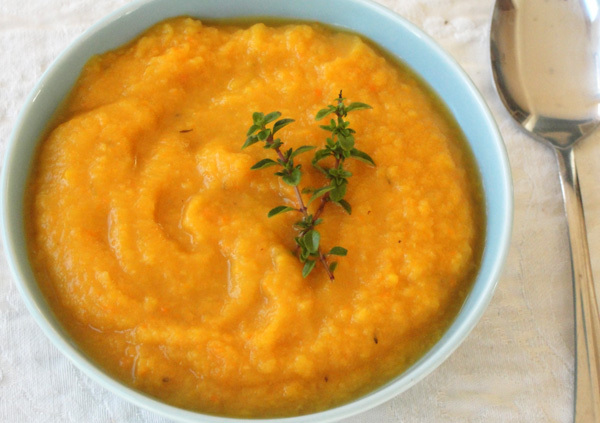 This entry was posted in Dinner, Lunch and tagged carrots, ginger, gluten-free, glutenfree, lemon, onion, potato, soup, vegetarian on October 8, 2013 by nursingmomscook. The weather is starting to turn colder making it an excellent time to start stocking the freezer with fall comfort food. This is one of my favorites to make in bulk, you can freeze it for individual servings or you can feed a crowd with it. When cutting up the jalapeno it is very important to wear gloves! If you get the residue from the seeds on your hands and say, rub your eyes or touch a baby they will be burning soon after. Play it safe and wear gloves. Heat a Dutch oven (or other heavy 5-quart pot) over medium heat. Add bacon; cook until crisp and brown, 6 to 8 minutes. Raise heat to high; add turkey. Cook, stirring and breaking up meat with a spoon, until no longer pink, 8 to 10 minutes. Add onion, garlic, and jalapenos; cook until soft, stirring often, about 5 minutes. Stir in chili powder, cocoa powder, and cumin; cook, stirring, until fragrant, 1 minute. Break up tomatoes with a spoon or your hands, and stir them in along with the puree. Add molasses, 1 cup water, and 4 teaspoons salt; bring to a boil. Reduce heat to a simmer; cook, partially covered, 30 minutes. Add beans; continue cooking, uncovered, until meat and beans are very tender, and chili is thick, about 30 minutes more. Serve with desired toppings. 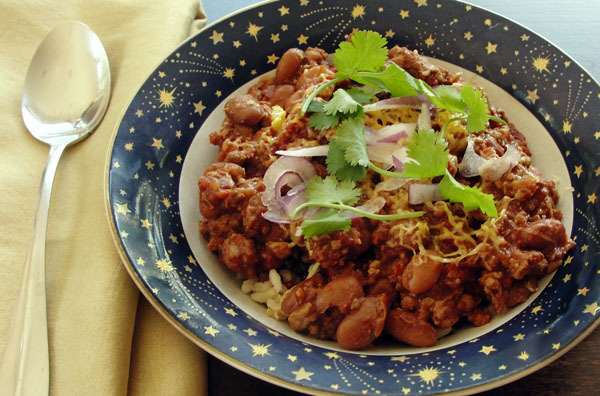 This entry was posted in Dinner and tagged beans, chili, cumin, gluten-free, glutenfree, jalapeno, onions, pinto, turkey on September 27, 2013 by nursingmomscook. When I was a kid and I wanted something sweet, my mom would always say “Have a piece of fruit”. For someone with a sweet tooth, a piece of fruit is a pretty sorry excuse for the treat that I really wanted. If only she knew about homemade banana ice cream. 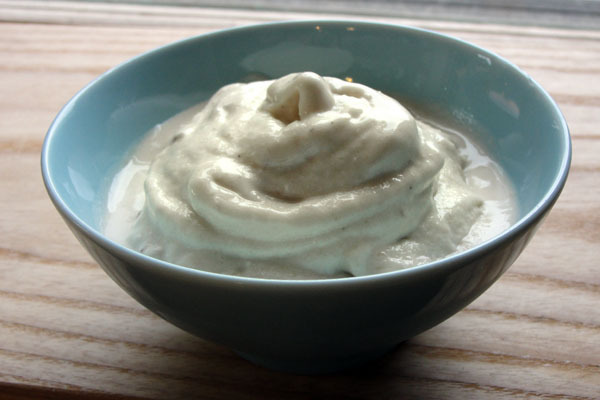 Frozen bananas and a little bit of milk together make something that is almost exactly like ice cream and totally satisfies any desire for a treat. You’ll need to do a little planning ahead. When the bananas on your counter get overly ripe and mushy to the point where they are too yucky to eat its time to freeze them. The key to the whole thing is to peel the bananas before you freeze them. If you don’t peel them first, it will be very frustrating to remove the peels from frozen bananas. So peel your very ripe bananas, freeze them for several hours and put them in the food processor with the milk of your choice. I’ve tried them with 2% milk, half&half and even with almond milk. Drizzle a little chocolate syrup on top to make it extra special. Peel the bananas and put them on a small tray or plate so they are not touching each other. Once they are completely frozen (at least 6 hours) put them in a food processor with the milk and blend until all chunks are smoothed out. Enjoy immediately. Serves 2-3. You can do this with any number of bananas that will fit in your food processor. Keep drizzling in more milk until the consistency is where you want it. 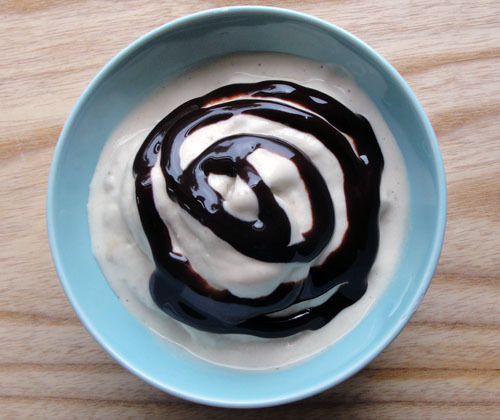 This entry was posted in Snacks and tagged bananas, gluten-free, glutenfree, homemade, ice cream, milk, vegan ice cream, vegetarian on September 18, 2013 by nursingmomscook. Hmmmm…I have some swiss chard, a few stalks of celery, a lemon and half a red onion. Today was one of those days where I looked in my refrigerator and saw a lot of stray produce that needed some love. Since we will be heading out of town on vacation this Friday, I needed to clean things up in there pronto or be faced with a) plenty of rotting greens upon return or b) throwing stuff out. I hate to throw stuff out. The solution came in the form of a tossed salad of the soon-to-be remains, proof that desperation leads to ingenuity. I had a veritable kitchen sink of bits and pieces from the bottom drawer that came together to make this nice summer side dish. I served it alongside turkey burgers. I began thinking about this as a rice salad with herbs and veggies tossed in but when I went to cook some rice, I had only a sad little handful left in the cupboard so I switched the plan to quinoa which cooks faster anyways. I cooked the quinoa, let it cool and tossed in the chopped veggies. I made my own dressing but you might be just as happy with a lemon-y vinaigrette from a bottle. Cook the quinoa according to the directions on the package. Let cool to room temperature. Cut the leafy greens from the stems of the Swiss chard and chop into 1” slices. Heat the olive oil in a pan over medium-low heat and sauté the greens for about 3 minutes, until they are wilted. Remove and let cool on a plate. Once cool, chop the chard a little finer. 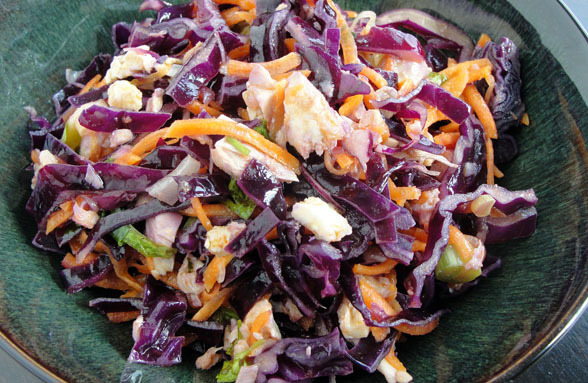 Combine the celery, red onion and basil and chard in a medium bowl. Add the cooled quinoa and toss. Season with salt and pepper. Add the dressing, toss and serve. This entry was posted in Dinner, Lunch and tagged celery, chard, gluten-free, glutenfree, lemon, quinoa, red onion, vegan, vegetarian on July 9, 2013 by nursingmomscook.